The Arizona Game & Fish Department has upgraded its live-streaming remote camera at Whitewater Draw Wildlife Area just in time for the 2018-19 winter season. 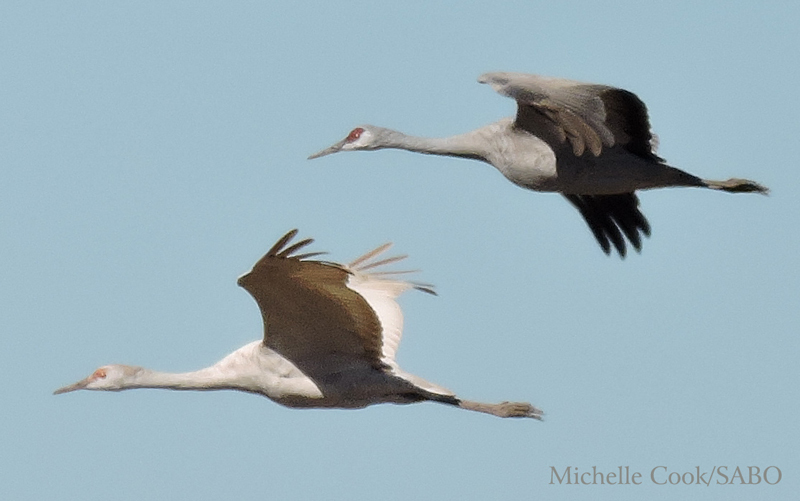 The best viewing times are before 8 a.m. MST, when the cranes are leaving the playa lake for their feeding areas, and between 10 a.m. and 2 p.m., when they return. If you’ll be visiting our area this winter and are interested in a guided tour with one of our naturalists to see the cranes and other birds live and in person, please contact us about personalized guiding for individuals and small groups. October is a month of change in southeastern Arizona. Most of our summer birds have departed, and our winter residents are just starting to arrive. It’s a time when we look back on our hectic spring-summer field season and look forward to what we hope to accomplish in 2019, with your help. 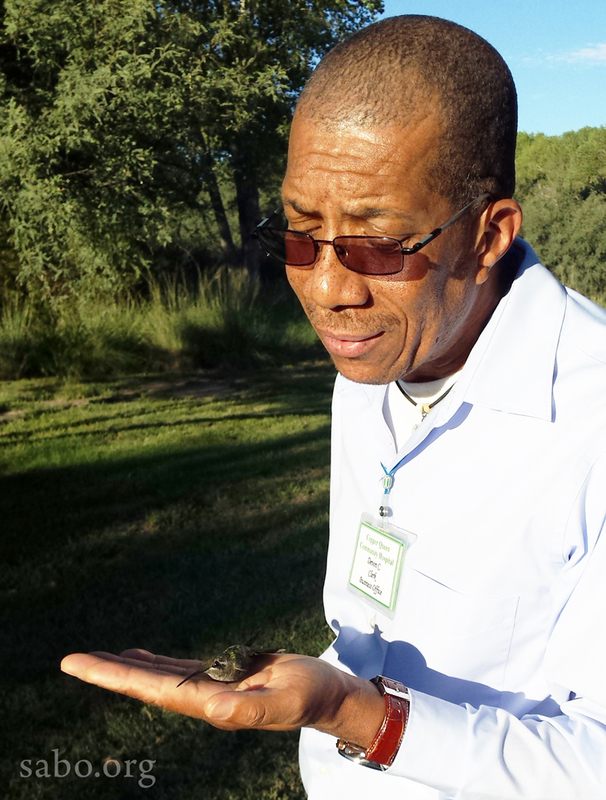 Our hummingbird monitoring on the San Pedro River just completed its 23rd season. 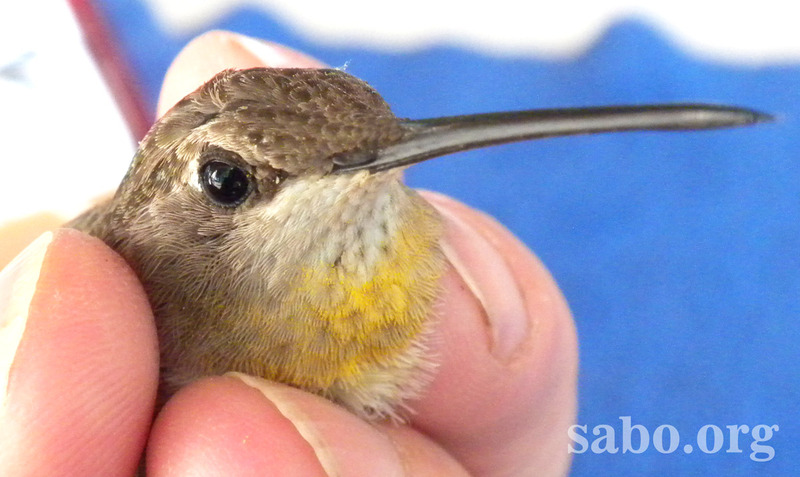 We caught nearly 600 hummingbirds this year, 98 of which were birds banded in previous seasons. Perhaps as importantly, our banding sessions were attended by around a thousand visitors: Boy Scouts, Girl Scouts, pre-schoolers, senior citizens, families, TV crews, print journalists, and resea rchers, all drawn by a fascination for hummingbirds. Our crew of dedicated, knowledgeable volunteers, some of whom have been with us more than a decade, have once again made the scope of this project possible. 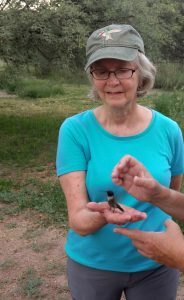 In late July, the annual “High Country Hummers” event in cooperation with the Arizona Game and Fish Department drew over 900 people to Sipe White Mountain Wildlife Area for a morning of hummingbird banding and a talk about our favorite subject. In September, we met with other hummingbird banders from around the U.S. and Canada and representatives of the North American Banding Council to update the manual used by hummingbird banders throughout the hemisphere. In August, we helped with both the Southwest Wings Birding Festival in Sierra Vista and Tucson Audubon Society’s Southeast Arizona Birding Festival. We also led three highly successful week-long birding workshops and tours of our own. 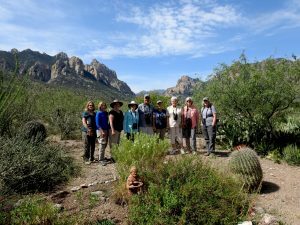 In May, our Owls & More workshop spent a wonderful week exploring the diverse habitats and dazzling diversity of southeastern Arizona. Our scheduled Hummingbirds of Arizona tour in mid-August proved so popular that we offered a second tour two weeks later which also filled to capacity. 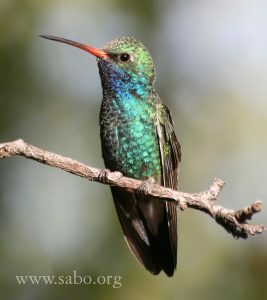 Despite the absence of the rarer hummingbird species this summer, the two tours found 12 and 11 species respectively. Our popular spring walks along the San Pedro River in cooperation with Casa de San Pedro Bed & Breakfast continue as we marvel at and document the amazing migration of songbirds along this crucial corridor. In September, we submitted comments on the Bureau of Land Management’s proposed management plan for the San Pedro Riparian National Conservation Area, drawing on our decades of experience on the river and our previous songbird banding study on the river south of the border. Other projects include our continuing relationship with the Arizona Game and Fish Department at Whitewater Draw Wildlife Area. 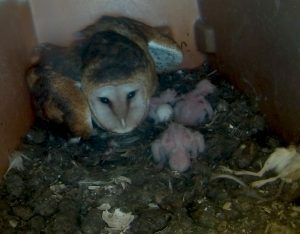 The nest boxes we erected two years ago produced broods of Barn Owls and American Kestrels this summer, and we plan to continue our commitment to providing some visitor services at the site again this winter. The relatively quiet fall and winter months allow us time to work on data management, with reports to the Bird Banding Lab and Arizona Game and Fish as well as analyzing the data collected with an eye towards trends and occurrences worthy of further research and/or publishing. Our entire database will be backed up at the Avian Knowledge Network and combined with over 100 million bird records for future analysis. The success of this year’s workshops and tours has encouraged us to offer even more next year. These include Hawks and Cranes in January, Sparrowphobics Anonymous in February, Owls & More in May, and Hummingbirds of Arizona in August. 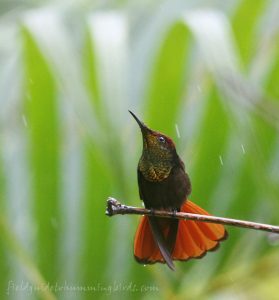 We are also venturing farther afield with Trinidad & Tobago: Fabulous Hummingbirds & More this December, Birding Alamos, Sonora in March, and Hummingbirds of Ecuador in June. We would love to have you join us on one or more of these trips. Please check the website for details. If it sounds like we’ve been busy, we have! We could not do any of this without the generosity of our members and donors. Your support is especially critical right now to get us through the slow fall and winter months and give us a head start on our goals for 2019. We hope you will consider joining, renewing or upgrading your membership and/or making an additional donation to help us continue to work on your behalf for the birds and other wildlife of southeastern Arizona. The Southeastern Arizona Bird Observatory is a 501(c)(3) nonprofit organization. Donations are tax-deductible to the extent allowed by law. SABO’s spring River Walks and hummingbird banding sessions are now on the events calendar! 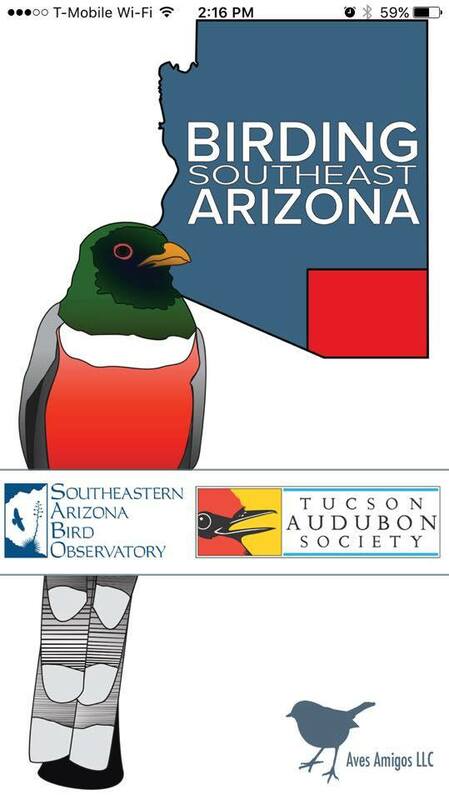 Please note that there will be no walks or banding sessions April 9-14 during the American Ornithological Society meeting in Tucson, but we’ve added Sunday walks on April 8 and 15. Registration for SABO’s 2018 Owls & More! spring tour is now open! 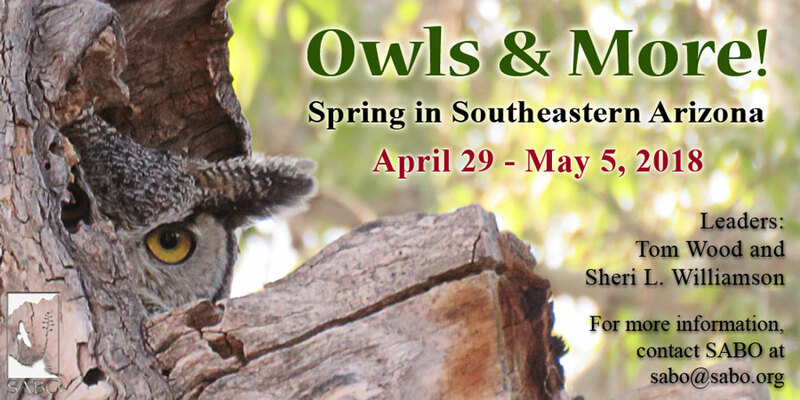 Reserve your space now for this 7-day, 6-night adventure highlighting the best of spring birding in southeastern Arizona! For registration or more information, see our Calendar of Events. 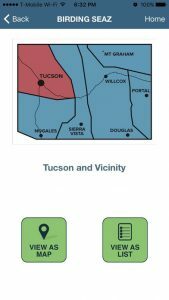 New Birding Southeast Arizona app now available! 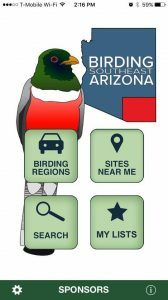 The new Birding Southeast Arizona app is now available for Apple iOS device (iPhone, iPad), and an Android version is coming soon! 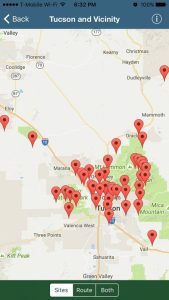 A collaboration between the Southeastern Arizona Bird Observatory and the Tucson Audubon Society with funding from the Southeastern Arizona Birding Trail committee, the app covers 130 birding sites in six subregions, all vetted by local experts. 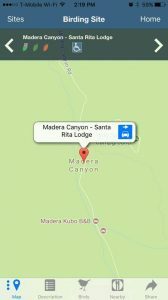 Track and log your sightings and share custom sighting maps with your friends. 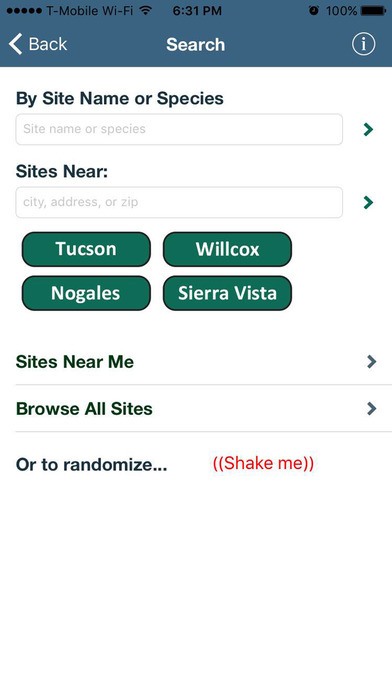 The app is listed in the App Store as “Birding SEAZ.” Proceeds benefit the education, research, and conservation programs of the Southeastern Arizona Bird Observatory and Tucson Audubon Society. $1325 per person for SABO members, $1355 per person for non-members, double occupancy*; add $415 for single occupancy. 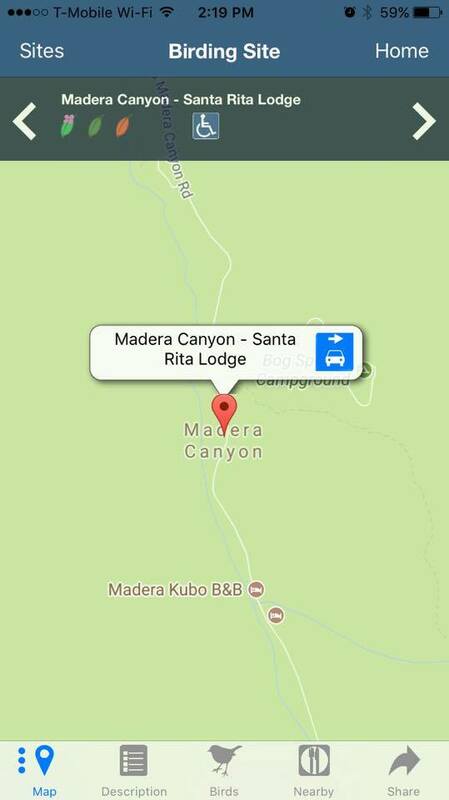 Package includes 6 nights’ lodging, ground transportation from Tucson, entrance fees, and meals from dinner the first day through breakfast the last day. Alcoholic beverages, guide and lodging gratuities, and other personal expenses are not included. Limited to 8 participants. A deposit of $200 per person is required to hold your reservation. To register, visit the main event page. For additional information, please contact SABO. * Standard rooms at Country Inns & Suites and Casa de San Pedro are equipped with one king bed; please let us know if your party will need two beds. 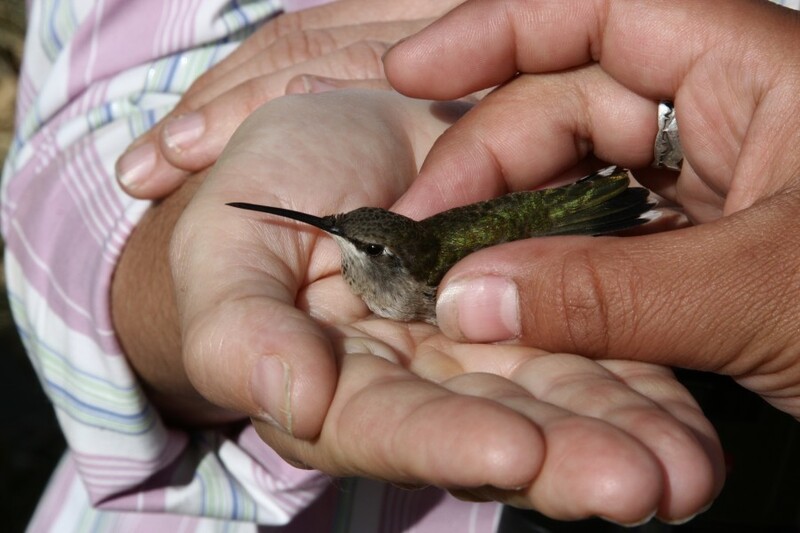 Big hummingbird banding news – REALLY big! 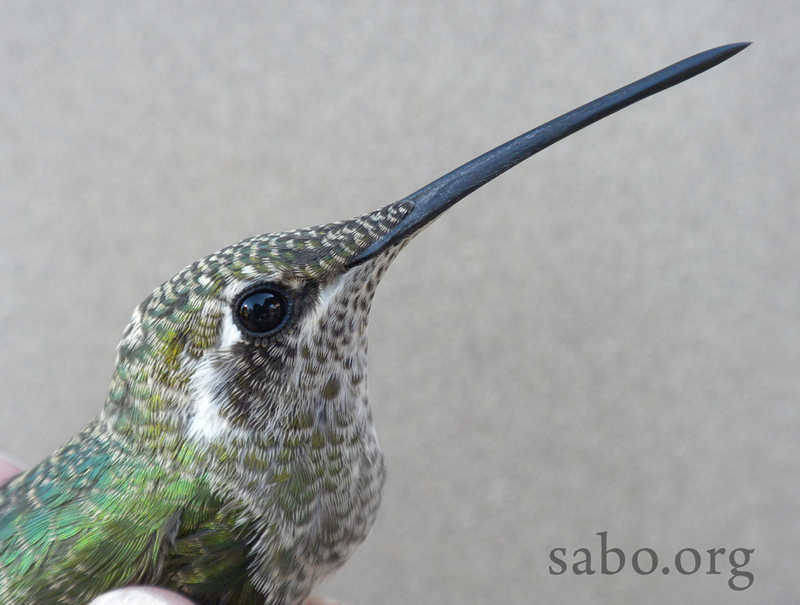 The diversity of hummingbird species in SABO’s ongoing monitoring project on the San Pedro River now goes to eleven! 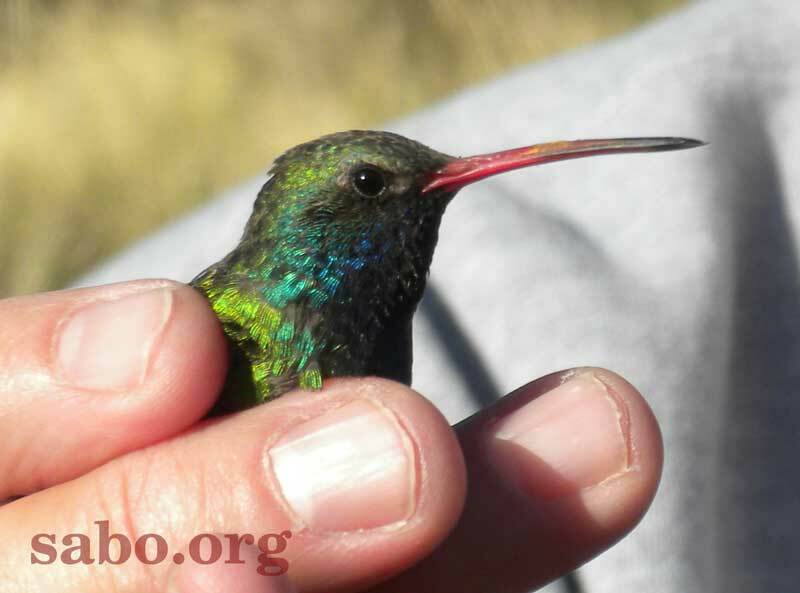 A juvenile female Magnificent Hummingbird, banded last Thursday at Casa de San Pedro B&B, is the latest addition to our study. She’s a giant compared to our usual clientele: bill length 27.3 mm, wing length 67.2 mm, tail length 40 mm, weight 7.3 grams. A juvenile (“hatch-year”) female Magnificent Hummingbird poses for her “mug shot.” Look at that huge bill! Visitor Devon admires this rare mountain jewel while waiting for her to take flight. Only six banding sessions are left in the 2016 season (three at each of our two sites), and there may be few or no birds still around for the last two sessions, so make plans to join us this weekend or next weekend. See SABO’s Calendar of Events for more information. Thanks as always to our dedicated volunteers, our hosts Karl and Patrick at Casa de San Pedro and the Friends of the San Pedro River, and SABO’s many members and donors, all of whom make possible the continuation of this landmark study. 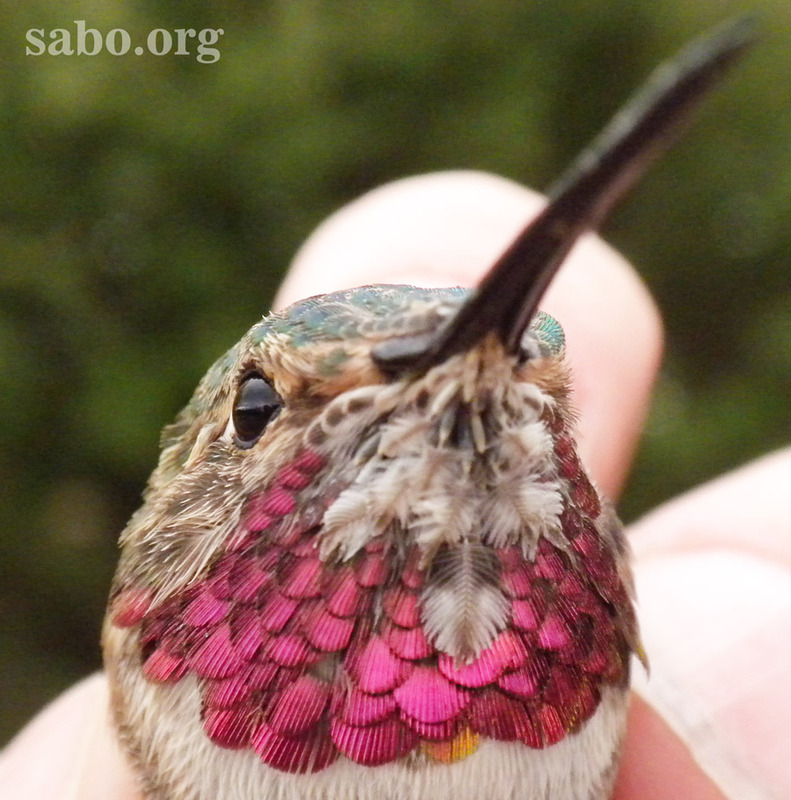 It’s been a very busy spring at SABO’s hummingbird banding stations! Our team has been seeing lots of recaptures from previous seasons (including one at least 8 years old! ), many females with developing eggs, and various colors of pollen reflecting a good season for natural nectar, but also one bird that’s seen some hard times. Check out the photos below for highlights! A male Broad-billed sports a layer of orange pollen on his red and black bill. One of the most-asked questions this time of year is “What kind of hummingbird has a yellow throat?” The answer is “The kind that likes ocotillo nectar.” The ocotillo’s long stamens deposit its bright yellow pollen on the throat of longer-billed hummingbirds such as this Black-chinned female and on the breasts of shorter-billed Costa’s and Anna’s. It’s rare that we can age spring migrants by their plumage, but this second-year male Broad-tailed is an exception. The pale, worn feathers on his chin are remnants of his juvenile plumage, soon to be replaced with his hot pink adult finery. 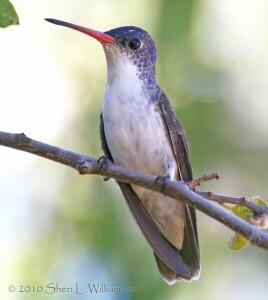 For many years we’ve been documenting the acquisition of white feathers by adult hummingbirds. This female Black-chinned was completely normal-looking when we banded her as an adult in July 2014, but she surprised us this year by returning with a generous sprinkling of white feathers over most of her body. This phenomenon has recently been given the name “progressive graying” to reflect its similarity to the age-related graying of human hair. This male Black-chinned has been through some hard times. His bill is heavily scarred, most likely from a recent bout of avian pox. The pox virus, which can be contracted from feeders that have been visited by infected birds, usually attacks the bill, feet, and/or eyelids. 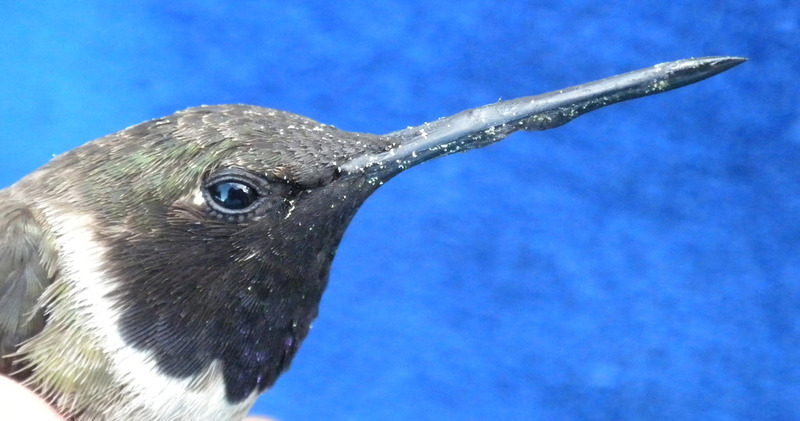 Hummingbirds’ bills are packed with sensitive nerve endings, so pox lesions on the bill are probably very painful. Though this bird’s bill appeared well on its way to healing, he was alarmingly underweight and his plumage was disheveled from inadequate preening. The best way to prevent transmission of avian pox is to clean feeders thoroughly and often, especially if they’re being used by birds showing signs of the disease. A dilute (pastel) Sandhill Crane at Whitewater Draw Wildlife Area, January 31, 2016. A very rare “pastel” Sandhill Crane is spending the winter at the Arizona Game and Fish Department’s Whitewater Draw Wildlife Area. This handsome mutant was spotted by SABO Director/Naturalist Tom Wood on January 31 during the flock’s midday fly-in and photographed by SABO member Michelle Cook. Pigment abnormalities of any kind are seldom observed in Sandhill Cranes, affecting fewer than one in 200,000 individuals. This bird, which we’re calling “Pearl,” sports very pale plumage, a condition known as dilution. Both eumelanin, the pigment responsible for blacks, grays, and dull browns, and the red-brown pigment pheomelanin are present but at greatly reduced concentrations, a form of dilution called “pastel.” “Pearl’s” bill and legs are also paler than those of a normal crane, which is typical for dilute birds. On its forehead, some pale orange skin shows through pale beige juvenile feathers. The red skin color of adults is created by carotenoid pigments unaffected by dilution mutations, so “Pearl” should have a normal-looking red forehead if it survives to adulthood. 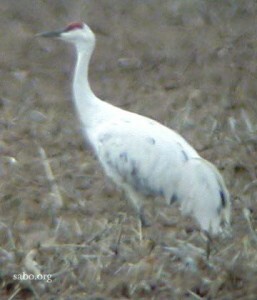 Archive digiscope photo of “Moby,” a “pied” Sandhill Crane that spent the winter of 2003-2004 in the southern Sulphur Springs Valley. Its condition is more likely to be the result of progressive graying than partial leucism. An odd-colored adult Sandhill Crane that spent the winter of 2003-2004 at Whitewater Draw Wildlife Area, dubbed “Moby” by SABO staff, had mostly white plumage with scattered normal and gray-shaded feathers and normally pigmented eyes, bill, legs, and forehead. A pattern like this is consistent with a common but mysterious condition called “progressive graying.” Affected birds appear normal in their early years of life but acquire white feathers with age, sometimes becoming mostly or entirely white. Extreme cases may ultimately affect the skin, bill, and legs as well. This condition may be related to the human pigment disorder vitiligo or simply represent an avian version of gray hairs. With rare exceptions, progressive graying is nearly indistinguishable from leucism* (pronounced with a hard “c”), a relatively rare condition characterized by pure white feathers either in patches among normal ones or over the entire body. Affected birds with no normal feathers (total leucism) usually have unpigmented skin, bills, and legs and are distinguished from true albinos only by their normally colored eyes. Partially leucistic birds have patches of pure white feathers among normal ones, often in nearly symmetrical patterns, and skin that may be normal or patchily pigmented. Albinism is an extreme condition in which affected animals produce no melanin pigment at all; though you often see the term used informally, there is really no such thing as “partial” albinism. The reduced melanin may make “Pearl” more vulnerable to sunburn and feather wear as well as more conspicuous to predators. Nevertheless, we have high hopes that this remarkable bird will survive to winter with us again. Grouw, Hein van. 2013. What colour is that bird? The causes and recognition of common colour aberrations in birds. British Birds 106(1-56):17-29. Many thanks to Michelle Cook for documenting this rarity and allowing us to use her photo to illustrate this post! If you are lucky enough to see and photograph “Pearl” and would be willing to allow SABO to use your photos in our education and outreach programs, please contact us. * “Leucism” has a long history of misuse as a catch-all term for any reduction in pigment. Sandhill Crane Cam at Whitewater Draw Wildlife Area! If you can’t join SABO this winter for a Whitewater Wetlands Walk and/or Sandhill Crane Watch, the Arizona Game and Fish Department has provided the next best thing: a live video feed from the playa lake at Whitewater Draw Wildlife Area! The feed is best viewed between 6:30 to 8:00 a.m. when Arizona’s largest flock of Sandhill Cranes departs for breakfast in nearby farm fields, between 11:00 a.m. and 2:00 p.m. when the majority of the flock returns, and between 4:00 and 6:00 p.m. when the last stragglers return to the roost for the night. Even when the cranes are not present, you may see some of the ducks, shorebirds, songbirds, and birds of prey that make their winter home at the wildlife area. Thanks to our colleagues at Arizona Game and Fish for sharing our cranes with birders and wildlife watchers the world over!